Wayne Henninger Communications (WHC) is led by Wayne Henninger, a communications professional with 25 years of public relations, strategic communications, event planning, and feature writing experience. In the early 1990’s, Wayne was a member of the Detroit Pistons public relations department where he gained valuable experience during the NBA playoffs, the NBA Draft, game day operations, and NBA special events. As president and co-founder of Washington, DC-based WAVE Public Relations, Inc., Wayne was responsible for overseeing, promoting and generating business for the entire firm. He coordinated campaigns for events, brands, and companies of all sizes. He led the team that launched Major League Lacrosse, and designed the media relations campaigns for the Senior Olympics, DATABASICS, and Potomac Electric Power Company. For four years, Wayne was the weekly “Using PR” columnist for the respected Street & Smith’s Sports Business Journal where he wrote about PR and marketing programs from teams, professional leagues, and sports brands. Wayne has written for ESPN – The Magazine, where he crafted pieces about colorful sports and entertainment stars such as Carlos Santana, Ludacris, and Kristi Yamaguchi. As an independent publicist, Wayne worked on communications programs for many top brands and companies including Oppenheimer Funds, Chevrolet, Cadillac, Gaylord National, The Alamo, Army National Guard, The Weather Channel, U.S. Department of State, Giant Food, US Airways, Brewers of Pennsylvania, and Clinical Data Interchange Standards Consortium. 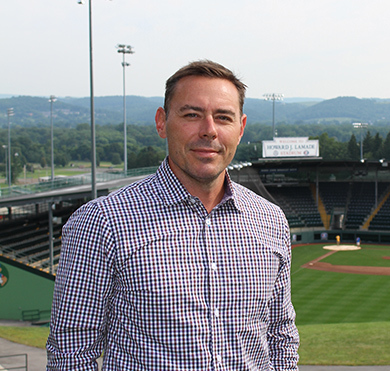 In 2013, Wayne temporarily filled the vacant Vice President of Communications position for Little League International, running the entire communications department for the world’s largest youth sports organization (80 countries). In that position, Wayne spearheaded the communications program for the Little League Baseball World Series, and the organization’s 75th Anniversary, an initiative that garnered millions of impressions. News of the diamond anniversary appeared in every major U.S. market, and in communities throughout the world. Wayne was recently profiled in his alma mater’s magazine for his work with Little League International. In 2015, Wayne returned to his entrepreneurial roots by launching Wayne Henninger Communications, LLC. He leads a talented public relations team committed to properly communicating messages and stories to audiences who will positively influence and impact agency partners.